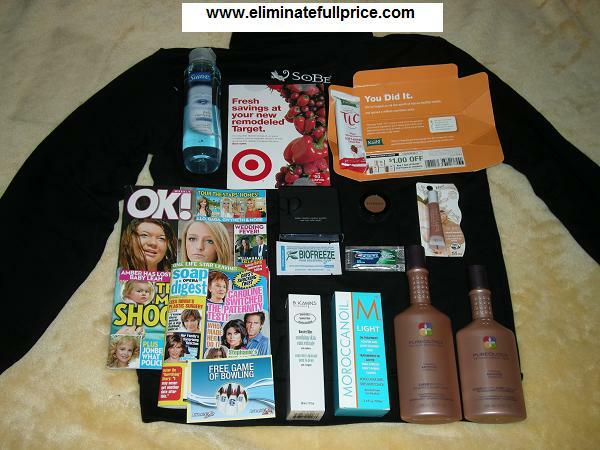 Eliminate Full Price: Mailbox Monday - Over $200 worth of prizes from Allure Magazine! Mailbox Monday - Over $200 worth of prizes from Allure Magazine! Once again I received a lot of prizes from Allure magazine. My favorite freebies I received are the Cle de Peau platinum eye shadow quad which is valued at $80 and the B. Kamins Chemist Booster Blue Soothing Skin Concentrate which is valued at $75. I can't wait to use these. Another favorite freebie of mine is the Sobe track jacket I won from their Instant Win Game that is now over. I was surprised at how nice the jacket is. I was expecting it to be cheap looking and covered with the Sobe logo but it's decent. The logo is small and discreet. It's actually manufactured by American Apparel which is a respected brand. Their clothing is made in the USA. -Suave shampoo from being one of the 1st 100 people to enter Allure magazine's August 2010 giveaways. The price is $2.19. -Cle de Peau platinum quad from being one of the 1st 50 people to enter Allure magazine's August 2010 giveaways. The price is $80. -Sephora eye shadow I won from being one of the 1st 100 people to enter Allure magazine's August 2010 giveaways. The price is $12. -Soft Lips Gloss I won from being one of the 1st 10,000 people to enter Seventeen magazine's giveaway. -Moroccan Oil I won from being one of the 1st 50 people to enter Allure magazine's August 2010 giveaways. The price is $39. -Pureology I won from being one of the 1st 500 people to enter Allure magazine's August 2010 giveaways. The price is $27. -B. Kamins Chemist Booster Blue Soothing Skin Concentrate I won from being one of the 1st 300 people to enter Allure magazine's August 2010 giveaways. The price is $75. Love those full size freebies! What's your secret for winning the Allure giveaways? ?